Description: A stiff rigid starfish with a sandpapery texture to the dorsal surface. This species comes in a wide variety of colour forms, reds, browns, purples and yellows. Sometimes the disc and inner portions of the arms is much darker than the outer part of the arms, as though the animal has been splashed with paint. The dorsal spinelets are more opaque and irregular than in Henricia sanguinolenta. Usually about 12cm across. 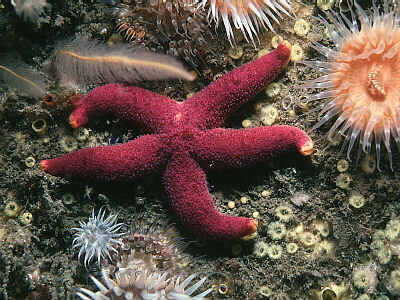 Habitat: A very common starfish in sublittoral habitats with considerable water movement. Found in the most exposed sites, in kelp forests, in tidal-stream rapids and on vertical cliffs. Distribution: Apparently a southern form in the British Isles, occurring on all western coasts. Confusion with Henricia sanguinolenta makes it difficult to be precise. Similar Species: It may be impossible to distinguish this species from Henricia sanguinolenta except in the laboratory. Dorsal spines blunt and covered with skin. Picton, B.E. & Morrow, C.C. (2016). Henricia oculata (Pennant, 1777). [In] Encyclopedia of Marine Life of Britain and Ireland.